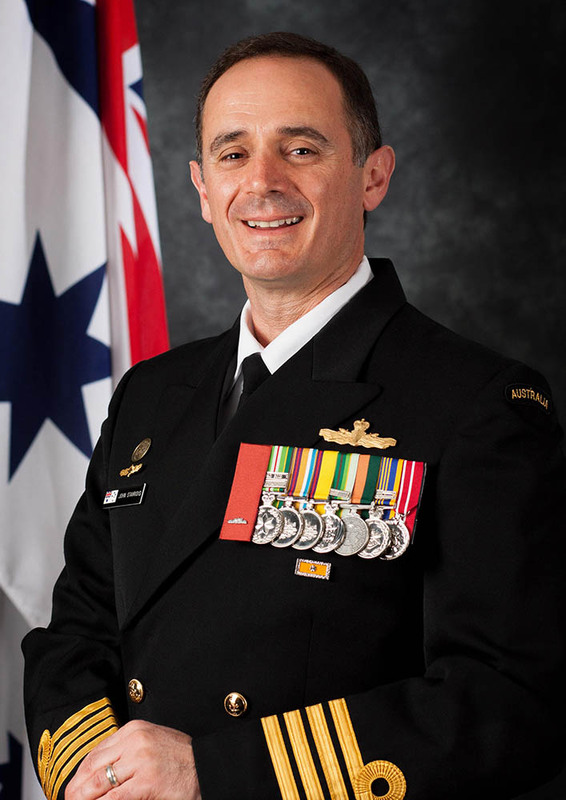 Captain John Stavridis was born in Sydney and educated at Trinity Grammar School prior to joining the Royal Australian Navy in 1988. He graduated from the Australian Defence Force Academy in 1991 as a Distinguished Graduate with a Bachelor of Science (Honours) in Oceanography. Captain Stavridis is a Principal Warfare Officer with specialisations in Surface Warfare and Communications. As a junior officer he served in HMAS Perth (II), HMAS Hobart (II), HMAS Brisbane (II), HMAS Sydney (IV), HMAS Anzac (III) and HMAS Stuart (III). In the course of these postings Captain Stavridis completed numerous deployments including operations, international engagement and border protection. In 2010, Captain Stavridis assumed command of HMAS Arunta (II) conducting international engagement activities along with a number of major exercises before the ship entered a period of extended readiness in mid-2011. Later that year Captain Stavridis assumed command of HMAS Anzac (III) which included an operational deployment in support of the Australian Government’s commitment to combating terrorism and piracy. Anzac was awarded the Gloucester Cup for the most outstanding unit in the Fleet, the Spada Shield for the surface combatant foremost in operations along with a number of other awards in the fields of electronic warfare, communications and information systems along with supply excellence. In 2014 he was awarded a Commendation for Distinguished Service for his performance as Commanding Officer of HMAS Anzac (III). In December 2016 Captain Stavridis assumed command of Australia’s first Aegis destroyer, NUSHIP Hobart, now HMAS Hobart (III) following the ship’s commissioning on 23 September 2017. During his period in command HMAS Hobart (III) conducted the full suite of operational tests and evaluation including the inaugural Combat System Ship Qualification Trials in the US resulting in the achievement of Initial Operating Capability in December 2018. Ashore, Captain Stavridis has served in a number of roles including training force, capability development, communications and project management. Captain Stavridis is a graduate of the Singapore Command and Staff College (2007) and the United States Naval War College (2014). He holds a Master of Science (Information Technology), Master of Commerce (Accounting), Master of Business Administration and is a qualified CPA. Captain Stavridis assumed command of HMAS Watson on 17 January 2019.